An angling lifetime of waiting finally ended for Vince Battams when he not only landed his first 20lb carp – but had it from a water he has spent years helping nurture back to health! Turning the scales to 23-1 it was a good fish in its own right...but coming from Abington Park Lake – the subject of so much restoration work following prolonged problems and abuse – it has to be the equivalent of a 30 from many other waters! STANWICK’s Elsons was on fire this week with Vlad Vladislav leading the way with a 40-2 PB as Dave Partridge – also on a PB – netted a 32-12 mirror and Alex Osborne took five from 20lb to 28-2: all in a week when the venue produced a flush of other 20s. ON the carp match scene results were all over the place – which is more than can be said for the fish which, on most waters, seemed to be shoaled up in small groups leading to a few good weights and a lot of blanks or near blanks. WHITE Hart Flore, Tofts: Tom Griffiths 104lb, Dave Cleaver 101lb, Dave Griffiths 93lb. ROYAL Oak, Packington: Grant Merritt 81-4, Cliff Skyrme 33-12, Wayne Sharman 31-10. GLEBE, Tofts: Dave Haddon 67-3, Russ Lay Jnr 45-8, Dave Jones 44-4. WHITE Hart Flore Oldies, Dog Lane: Trevor Griffiths 62-8, Tom Griffiths 38-10, Glen Tilson 29lb. FINEDON, Waterloo Farm: Steve Amos 50-5, Paul Lafflin 44-3, Bill Boyne 39-6. FLORE & Brockhall, Barby Mill: Brian Johnson 32lb, Steve Smith 23lb, Fred Johnson 20lb. CASTLE spring league round, Canons: Jeff Rice 21-13, Bob Spencer 19-14, Geoff Lewis 9-12. ‘ASHBY opens: Wed., Brickyard, Mick Hewlett 22-8, Courtney Hewlett 18-12, Mick Boddilly 16-14; Sat., Brickyard, Boddilly 31-12, Darren Driver 28-8, Chris Garratt 24-8; Sun., Grendon, Bob Reed 35-12, M Hewlett 22-14, Garratt 20-6. RYSONS open: Ian Smith 23-10, Derek Pettit 12-9, Carl Yeowl 10lb. WILLOW Brook open: Pete Hawley 21-3, Andy Webster 14-14, Chris Howard 14-3. 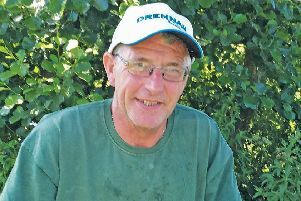 TOWCESTER, Silverlake: Mick Goodridge 18-12 (one carp), Gerald Green 14-4, Kevin Nightingale 10-2.